The Lawrence de Graaf Center for Oral and Public History will be offering a fall workshop. RSVP today for this introductory oral history session at CSU, Fullerton. Opening Reception: April 26, 2017 5:30P.M. For more information, please call 657-278-3580. Visit the Center for Oral and Public History website for updates. Mr. Keir Pearson from 4pm – 5pm in PLS 360! 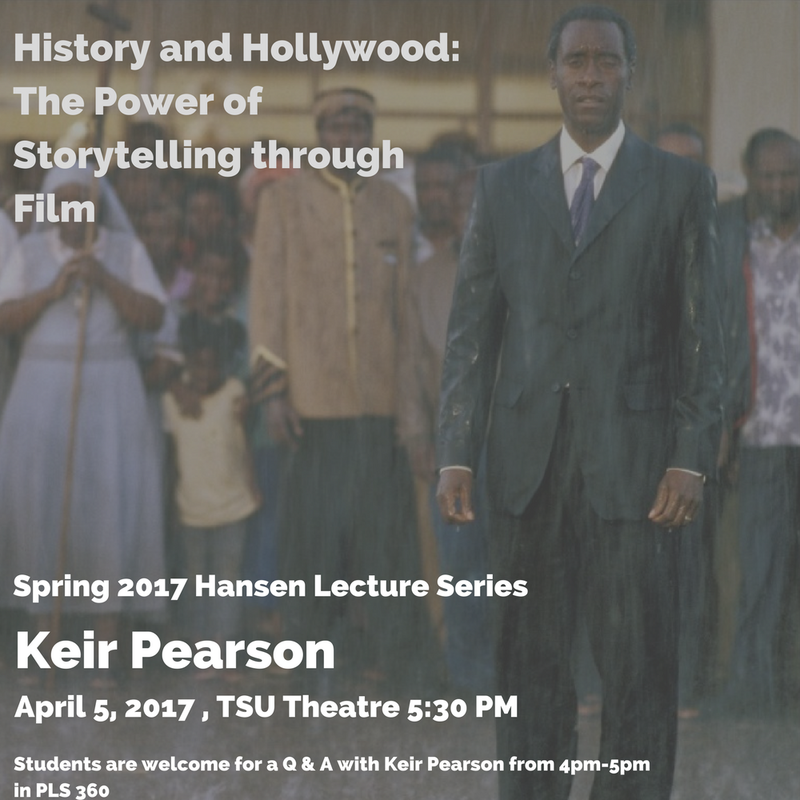 Pearson, an Oscar-nominated screenwriter of “Hotel Rwanda,” will speak on “History and Hollywood: The Power of Storytelling Through Film” April 5 as part of the Lawrence de Graaf Center for Oral and Public History’s annual Hansen Lecture. Pearson, also the executive producer and screenwriter of “Chavez,” has worked extensively on historical biopics usually with sociopolitical undercurrents. He’s worked for Warner Bros., Paramount, HBO, Fox TV and History Channel. The Hansen Lectureship was created by the Lawrence de Graaf Center for Oral and Public History in honor of Arthur A. Hansen, CSUF professor emeritus of history and retired center director. The lectureship also funds an annual fellowship for a CSUF student pursuing a master’s degree in history with an emphasis on oral and public history. The event begins at 5:30 p.m. in the Titan Student Union’s Titan Theatre. It is free and open to the public. Students can participate in a meet and greet with Pearson from 4 to 5 p.m. in Room 360 of Pollak Library.